Middletown (population 434) is located in west Logan County at the intersection of County Roads 1300th Street and 50th Avenue. A nearby town of note for location purposes is Lincoln just 14 miles to the east of Middletown. A branch of the Salt Creek runs through the southwest side of town. 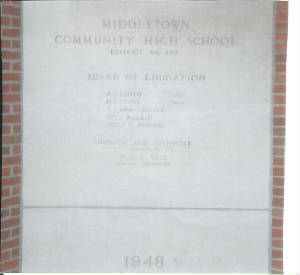 The origin of the town dates back to 1836, as the first known school in MIddletown was started as a subscription school, which meant that tuition was charged. 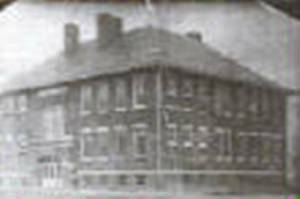 The educational system in Middletown grew steadily that by 1910, a school was built for the fourth time. Only this time, a three-year high school was included with the grade school. The high school curriculum stayed at three years until 1940 when a fourth year was added. A new high school was built in 1948, as evidenced by a photo above. The school system remained in intact until 1960-61 when Middletown and nearby New Holland began their talks of consolidation. This effort became a reality in 1961 with the creation of the New Holland-Middletown school district. There are also pages on this site for New Holland and New Holland-Middletown, which closed in 1988. The children of Middletown are now attending school as a part of the Lincoln School System. 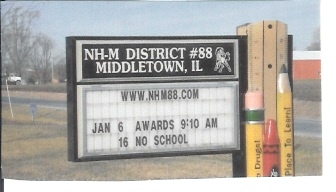 When the New Holland-Middletown system was started, the high school was located in New Holland and the grade school in Middletown. 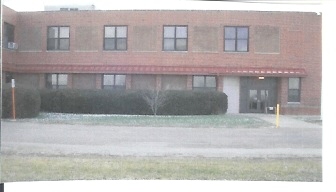 When the New Holland-Middletown school was closed, Middletown kept its grade school (the old high school building), which now serves its kids for grades K-8 as a part of the Lincoln school system. The only sport listed on the IHSA web site (www.ihsa.org) for Middletown High School is boys basketball. Though no IHSA hardware was won, Middletown was know as a very competitive team. Their best seasons are listed below. It is believed that Middletown also offered baseball and track. We are hopeful an area alum or fan will help us with the details. The best of the Middletown hardwood seasons are listed below. The complete record of each season is listed on the IHSA web site covering the years from 1935 through 1961. The photos on this page are courtesy of Jon, Jim, and Dan Wheat who spent a sunny Sunday afternoon in January (2006) getting these shots of the former Middletown High School building.